THEM: How's you? Saw you didn't love Trullo? ME: No, Trullo was so disappointing on many levels. THEM: ergh... how did she manage that? ME: Well, still on the Vic line, so not a total nightmare. We asked if there was any flexibility on the table time as they wanted it back by 9pm, so a 2 hour window, but they bluntly said not likely and maybe we could call her and read her the menu over the phone? ME: So, she arrived and all was good in the world (she ordered the rabbit fritti). Service got a bit better, all was looking good. So starters arrived, quail and kohlrabi salad, quail was nice, good aioli, kohlrabi was meh. THEM: Aioli? That isn't Italian! ME: So they cleared them away, and I didn't feel massively rushed at this stage, although we were conscious of the clock, so not exactly relaxed. Mains, as they so often are, were very disappointing. My 30 day sirloin was bland, overseasoned and weirdly chewy. The polenta tasted pretty disgusting in my eyes, with a huge amount of gorgonzola in it, so overpowering. 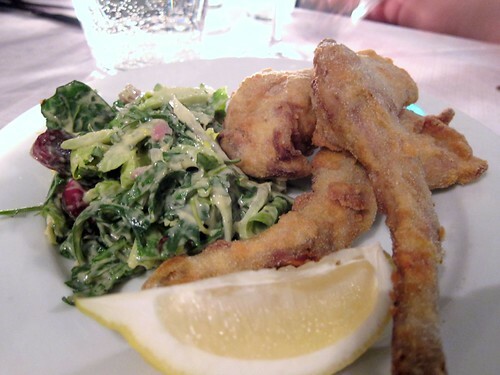 Rabbit came as "fritti", but also came with a rabbit offal salad which was so salty it was inedible. I hate doing it, but we had to send the salad back. They were very good about it and brought out a fresh lot pretty quickly. ME: They actually hurried us into ordering desserts, but brought us an extra tiramisu to make up for it. The blood orange panna cotta was not set enough and was starting to break up, and whilst ugly, tasted really very nice. Tiramisu would have benefited from being wetter (more coffee) but was on the whole very nice, and the only other thing that really rocked my world that night was the honeycomb and hazelnut ice cream. 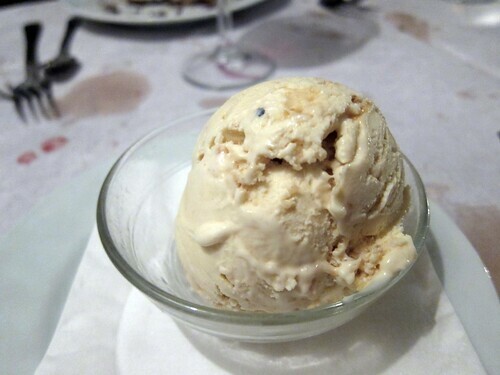 I have a soft spot for nut based ice creams anyway, but this was really excellent. THEM: Would you go back? So that was that, a thoroughly underwhelming meal which came to a total of £45 each (with wine and service). I sat at the bus stop patiently waiting for my bus in the light drizzle and reflected on what had gone wrong. The first major mistake was for a restaurant with ambition, and charging on average in the high teens per main, to impose a two hour turn around with no flexibility. At these prices, I would expect to be able to enjoy my meal without having to check my watch every five minutes and feel hurried by the staff. It left more of a bad taste in my mouth than the over salted food. Which is sort of my second point. The pastas were excellent, but everything else was either disappointing, inedible or average. Not really what I had hoped nor expected. As I text messaged a friend about the meal, my phone kept auto correcting “savouries” to “saboteur”. I can’t help thinking that there was a little bit of truth in that. Disappointing. Zucca would never do that to you! I agree with Lizzie, Zucca wouldn't! 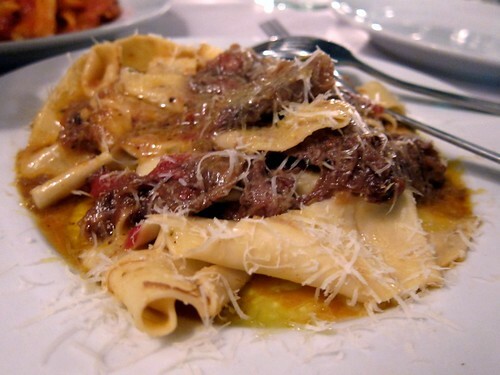 I have been trying to get a table at Trullo for months and it seems it was just as well that I was unsuccessful... The rabbit looks rather disgusting I have to say. And I hate when they hurry you to eat, really destroys all the pleasure. I went with a group of 4 and I was worried about the time limit. However we never felt rushed at any time and we thought the service was excellent. We each had a starter, a main and shared 2 desserts between us, plus wine. Bill came to about £35 per head which I thought was pretty good. I can see that, as the price increases, so would your expectations, and I probably wouldn't have been so impressed if I'd walked out of there paying £45+ per head. Doesn't sound good. Bummer, I've booked to eat there in a couple of weeks. @ Ute - We had booked 2 months in advance, hence the anticipation! The rabbit was described as "Kentucky Fried Rabbit" by one of our fellow diners. Quite an accurate observation. @ Lex - I think prices have definitely sky rocketed as we shared 3 mains between 4 and didn't have loads of drinks. Not good value. @ Mzungu - Mine may have been an especially bad experience. There have been loads of good feedback, so please go and report back! Didn't realised that Trullo is this sought after so much so that reservation has to be made so far in advance. Actually we were thinking of dropping in during one of those weekday afternoon but thought better of it as I don't supposed we could squeeze in a buggy, can we? Anyway, will not be in a hurry to head to Trullo after your review. Have a prosperous Rabbit year! Cheers! Interesting... When we went the fish/seafood delivery was also stuck on the motorway. 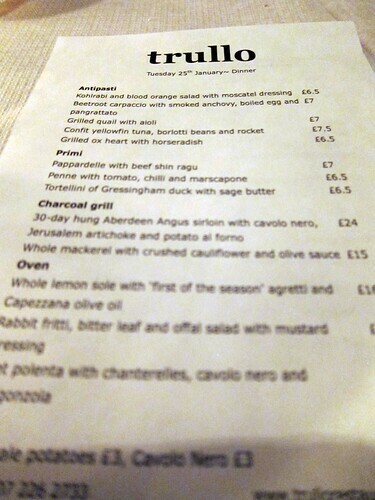 I haven't been back to Trullo in ages, but the two meals I had there a few months ago were both very good and very cheap. I hadn't realized it had become such a tough place to book. 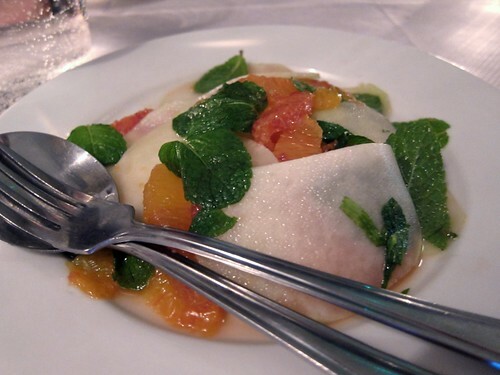 (And since we're talking about Zucca, I have been unsuccessfully trying to get a table there for at least as long as Trullo has been open). I hate time limits on tables (the 90-minute ones like that at Yauatcha) are the worst, but in my experience, if a resto chooses to have a time limit, they're always strict about it, yes? In other words, I don't like the practice, but I've also never encountered a resto with a time limit that they were loose about. @ AiL - I agree that if there was a time limit imposed, then we should definitely expect it to be enforced. Owing to extenuous circumstances, our table was delayed, and it was more the manner in which it was dealt with that frustrated and angered me. It didn't help that Nigel Slater was sat at another table, who was sitting down when we arrived, and only getting his dessert as we were ushered out the door. As the nitwit who couldn't distinguish one Italian restaurant form another, I think I have to bear the majority of the responsibility for the meal feeling rushed. If I'd turned up on time, we'd have had 2 hours to eat a meal, which is enough time. As it was we had 1 hour 15–20 minutes, so that we managed starters, pasta, main course and desserts is testament to our determination to eat. But the problem with table turning is that the food has to be good enough to make you feel glad/grateful for being able to get a 2 hour slot to try it. And it wasn't quite, was it? Starters were fine, pastas were well made but only one was genuinely excellent (the beef ragu was distinctly Bovrilish) and the main courses were badly over seasoned, kidney damagingly so in the case of my side salad (how do you oversalt a salad?). Puddings looked a mess – where's the pride in the food in sending out panna cottas that look like they've been bashed with a baseball bat, no matter how nice they taste? It was nice that we got a free tiramisu, it was nice that we got an extra 20 minutes (although it felt a bit like puddings and bills against the clock) and once the hopeless waitresses had been replaced by the capable waiter, the service was nice too. But is nice good enough to justify table turning and a bill just shy of £200. Not quite, I think, not quite. I completely agree about restaurants that charge high prices and give you a small dining slot timewise. It should be stopped. For god's sake, expecting so much for not very much money. 45 pounds a head is really not that expensive for the amount you eat.